Christopher Campbell-Duruflé is researching international law and climate change. Ido Katri documents the rise of trans rights for gender self-determination. Cynthia Morinville is looking at the electronic waste crisis through the lived experiences of the workers who handle that often-toxic waste. 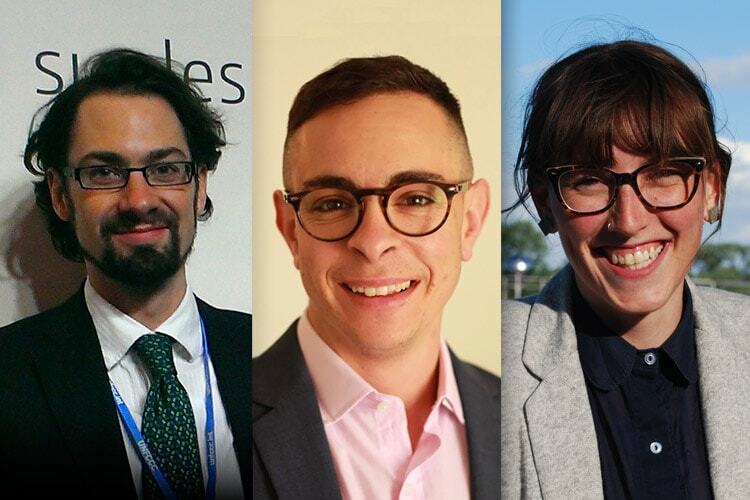 The three University of Toronto doctoral students are among 15 national recipients of the prestigious Pierre Elliott Trudeau Foundation doctoral scholarship for 2016. The Trudeau scholarship – regarded as the most prestigious doctoral award for the social sciences and humanities in Canada – supports doctoral students who are committed to solving issues of critical importance to Canada and the world. In addition to an annual grant of up to $60,000 over three years, the scholars will also benefit from the expertise of the foundation’s fellows and mentors. Campbell-Duruflé specializes in international environmental and human rights law. Besides pursuing his SJD, he is also co-chair of U of T’s responsible investment committee and an associate fellow at the Centre for International Sustainable Development Law at McGill University. Last December, he was officially accredited as an observer to the 21st Conference of the Parties to the United Nations Framework Convention on Climate Change (COP21). Katri has been an advocate for the trans community for over a decade. In 2010, he founded the first transgender association in Israel, and the following year he co-founded the Gila Project for Trans Empowerment to mobilize community resources to provide legal and social assistance and to advocate for broader institutional change. “I want to use to voice I have been given, by the University of Toronto and by the Trudeau Foundation, to bring those marginalized voices to the forefront of current and future public debates. Katri has other research interests as well, “focused on ‘in-between’ categories of law, transformations and passing and on the relation between racial/ethnic and gender performance, specifically with respect to Mizrahi Jews (Jews who have immigrated to Israel from Arab and Muslim countries). Morinville is currently looking at electronic waste and its effect on the people who eke out a living handling and dismantling it. Her research seeks to shed light on the ways in which rare metals embedded in electronic devices are valued, extracted and returned to markets. Before coming to U of T, she earned a master’s degree at the University of British Columbia, where she looked at access to water in Canada and internationally. The issue still interests her.